MountainRun were out in full force on the weekend of the Lakes 100 & 50 mile races. Each year for the last 4 years we have run the Buttermere Check Point, this year we looked after Ambleside as well. MountainRun is a new division of The Outdoor Warehouse (Windermere) Ltd. This was the iconic shop in Windermere, there since 1975 (called The Fellsman until the late 80's) & set up by David & Rachael Sproson, Charlie's parents. Having only been around for just over 18 months, MountainRun is starting to get a name for itself in the Mountain Marathon & Ultra Running scene. 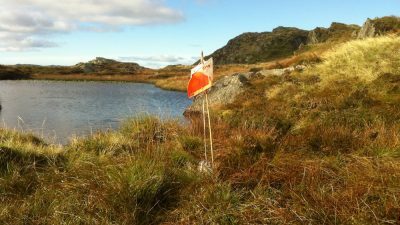 MountainRun offer courses for navigation, mountain skills, mountain marathon tactics & natural running, plan courses for Ourea Events & plan/race direct for The Keswick Mountain Festival Trail Races. MountainRun are also the preferred navigation trainers for the inaugural Lakes 100 & Lakes 50 ultra races. On top of all this The Outdoor Warehouse & MountainRun have looked after the Buttermere CP on the Lakes 100 for the last for year. This year we added Ambleside CP to our repotoire. Buttermere CP: The Buttermere CP is the perfect opportunity for us to look after the amazing runners who attempt the tough 100 mile trail race around the Lake District. Originally thought up by Dave Makin of the Achille Ratti Climbing Club, who hold the Old County Tops every year & made a reality by Marc Laithwaite & Terry Gilpin. We really enjoy the Buttermere CP, its relaxed & in the beautiful village of Buttermere, as the name suggests. Runners on the 100 mile course set out from Coniston at 6pm on the last Friday in July. The first runner arrives at the CP around 10 to 10:30pm, depending on who is racing that year. We had some of our usual team (in bold), headed this year by Nicola Merrett (Charlie's partner & the accounts person behind the ODW Ltd). Barney Whiteside (our resident photographer) & Jon Ritson (previous employee & friend of the ODW) joined the crew alongside David White (a MountainRun guide). Charlie was also part of the team, as 2 marshals this year had to pull out last minute. Also part of the crew early on in the evening was Winter Sproson, Charlie & Nicola's 18 month old son, plus of course Scratch & Pepa the fantastic fell running dogs who live with Charlie & Nic. As a light crew this year, we all worked hard to ensure runners were fed & watered to make the next leg from Buttermere to Braithwaite as good as it could be. Ambleside CP: Ambleside became available earlier on in 2014, the previous CP managers & crew not wanting to continue, so MountainRun jumped at the chance to run this CP as well for this year. This is a transition to MountainRun looking after this CP for 2015, as 2 CP's are a little tough to run year on year. Charlie was the manager, but was helped out by Clare Shannon, a Lakes 100 employee who keeps the organisation of the event & CP's on its toes. Together Charlie & Clare headed the team of amazing marshals who were comprised of Nicola Merrett (for the set up), Lindley & Maxine Chambers plus Lindley's 13 year old daughter (who looked after the runners needs & blister care amongst other things), Garfield & Helen Southall who served the soup, tea & coffee. Darren Lishman, Ambleside resident & long standing friend of Charlie who Dad held the record for the Loughrigg Fell Race record for many years, Melvyn & Allison Holloway & many other Lakes 100 volunteers who arrived during the evening to take the weight of 950 runners on the 100 & 50 mile course. The CP was buzzing throughout the evening & has an atmosphere quite different to the Buttermere CP, having much more activity, spectators lining the street where the runner approach from. This CP is almost European, having a real feel of the UTMB & Chamonix at its heart. Because running to CP's is a major undertaking, we will not be adopting this approach for 2015 & after lots of deliberation we have decided to move from Buttermere to Ambleside for the foreseeable future. So whats for next year? Well with all our attention focused on Ambleside in 2015 we plan to make it a CP for everyone to remember. We want more spectators lining the street, we want some music (as long as the village of Ambleside allows it) & we want a carnival atmosphere to make the runners literally buzz there way over the last 15 miles of the 100 & 50 course back to Coniston. Its about time the UK embraced sports like they do on the continent & MountainRun want to be part of this movement to celebrate physical fitness & mental toughness. Expect a real buzz at the Ambleside CP & a team of volunteers to remember if you're running through on your way to the finish. If you have idea's or want to get involved in THE Check Point on the UTLD 2015, then email us at enquiries@mountainrun.co.uk. See you all again in 2015!! MountainRun were the course planners for the first Marmot24, held over the weekend of the 2nd & 3rd of August. A course designed specifically towards the SLMM & other Mountain Marathons on the circuit.